The Universal Temple of Bhagawan Sri Ramakrishna at the Ramakrishna Mission Ashrama, Belgaum was consecrated in January 2004. To celebrate the completion of 5 years of this event, we have organized a 2-day programme at the Ashrama on 31st of January & 1st of February, 09. These programmes are aimed at spreading the life and message of Bhagawan Sri Ramakrishna, Holy Mother Sri Sharada Devi and Swami Vivekananda. 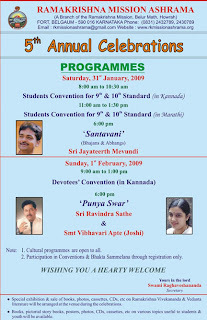 The 2-day programme includes student conventions – aimed to encourage & guide students to face the challenges of student life, devotees’ convention and cultural events like Bhajans by Shri Mevundi and Punya Sawr by Shri.Ravindra Sathe & Smt.Vibhavari Apte.